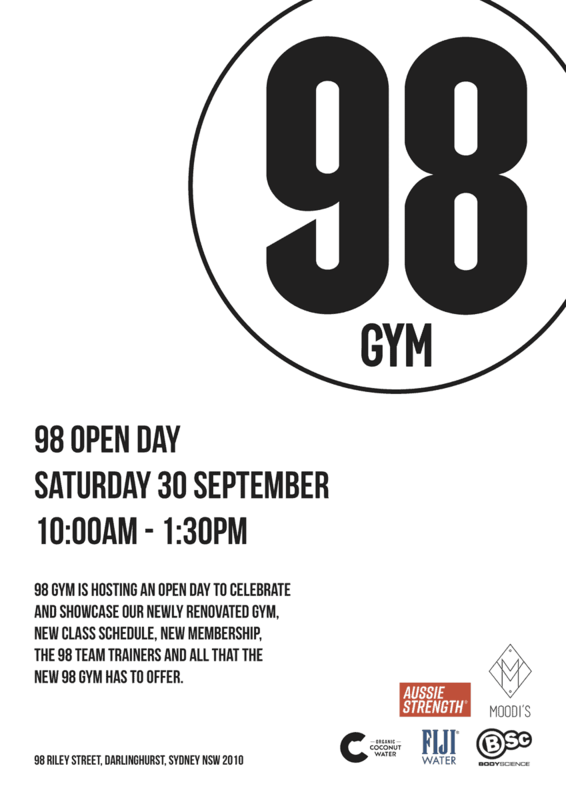 98 GYM IS HOSTING AN OPEN DAY TO CELEBRATE AND SHOWCASE OUR NEWLY RENOVATED GYM, NEW CLASS SCHEDULE, NEW (LIMITED) MEMBERSHIP OPTIONS, THE 98 TEAM TRAINERS…. AND ALL THAT THE NEW 98 GYM HAS TO OFFER!! WE’VE ORGANISED A MORNING OF WORKSHOPS AND COMPETITIONS FOR ALL. THE SKIERG CHARITY EVENT IS A FUND RAISER FOR THE ‘FIGHT MND (MOTOR NEURONE DISEASE) FOUNDATION’. IF YOU WANT IN, PLEASE SEE BELOW FOR FURTHER INFO AND GET A TEAM REGISTERED ASAP. OUR FRIENDS AT BODY SCIENCE, C COCONUT WATER, FIJI WATER AND MOODIS CAFES WILL BE SUPPLYING SAMPLES AND TREATS ON THE DAY. PLEASE COME ALONG BRING A MATE, HAVE A CRACK AT AN EVENT AND CHECK OUT 98 GYM. This will be a 5 person team event. All teams must include a minimum of 2 girls. The event will be a 30 minute max meter team skierg relay. Every 3 minutes the team must stop skiing and all complete 10 burpees each then return to the skis. The team with the most meters on the counter win. To participate please register your team with Chris ([email protected]) before Friday 22nd September. Kev is one of our most experiences strength and conditioning coach at 98. He spent 15 years serving the Australian military with 5 of those years spent managing the high performance program. Deadlifts are his bread and butter. Andy Ginn and Alexa Towersey will be adjudicating this competition. This will be maximum number of STRICT pull-ups without letting go of the bar. Don’t try and cheat these form gurus! There will be a prize for the highest scoring male and female. This event is open to all and on a first come first served basis. Moodi Dennaoui has extensive professional experience, and an unconventional approach to nutrition, which has earned him a reputable following across the globe. His success comes from his versatility to create, formulate and adapt nutrition and training programs that suit the amateur, as well as the seasoned athlete. Moodi has a wealth of knowledge and expertise gathered from his qualifications the University of Sydney covering everything from Nuclear Medicine, Mathematics, Education, Psychology, Nutrition, and a Masters in Research Methodology. Victoria Burdon and Julien Rinaldi will be pushing the competitors into a very dark place and hopefully out of the other side on this event. It is a 60 second all-out effort on the Assault Airbike for maximum calories. There will be a prize for the highest scoring male and female. This event is open to all and on a first come first served basis.